Atlantico 27. Luxury 2 bedroomed apartment situated on the wonderful Hacienda Riqueleme Golf Resort on the Costa Calida, Murcia Spain. This Unspoilt part of Spain enjoys up to 300 days sunshine per year has wonderful sights and beautiful beaches. Our Apartment Is Situated On The Second Floor And Boasts Wonderful Views Over The Golf Course And Surrounding Area. The Whole Resort Is Built Around A Restored 17th Century Spanish Manor House , Which Now Houses The Restaurant And Bar, Also Golf Pro Shop And Supermarket. Our Apartment Is Ideally Located To Take Advantage Of These Facilities Less Than 5 Minutes Walk. We Have Several Swimming Pools Available On Site For You To Use The Nearest Just 2 Minutes Walk. Other Facilities On Site Include Tennis, Football And Multi Sports Courts,there`s Bike Riding, Running And Gym Facilities. As Well As The Golf Of Course. For The Golfer`s The Course On Site Is Truly Excellent , Championship Standard And Very Testing. 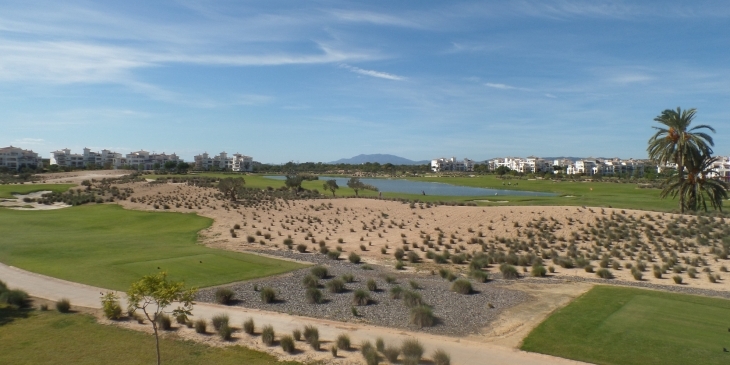 The Whole Area However Is A Golfers Paradise With Over 25 Courses In The Region. Our Apartment Actually Overlooks The Practice Area Below And Has Far Reaching Views Of The Mountains In The Distance. Accommodation In The Apartment Includes 2 Bedrooms With Twin Beds (can Be Pushed Together If Needed) Bathroom With Sink ,toilet,bidet And Bath/Shower. We Have Kitchen Complete With All Utensils, Living/dinning Room With TV, Play-station, DVD And Games For You To Use. There`s Balcony Terrace With Patio Doors , Also Barbecue And Patio Furniture. The Resort Itself Has Gated Entrance With 24 Hour Security And Number Plate Car Recognition Upon Entry. Our Building Has Buzz In Entry System, Making You And Your Family Feel Completely Safe. There`s A Children’s Play Area Just Outside The Apartment, But There’s Several On Resort Anyway. Local Attractions Include Beaches Nearest Just 15 Minutes Drive, There’s Water Parks, Zoo`s , Shopping And Loads Of Water Sports Going On In The Area. The Nearest Town Is Just Up The Road Less Than 5 Minutes, Sucina With More Bars , Restaurants And Shops. See What A Holiday Or Golf Break Could Be Like Here For You…..
For More Information Please Don’t Hesitate To Contact Us Or See Our Own Website.